We are a small, home-based kennel located in the Shark River Hills section of Neptune, New Jersey at "The Jersey Shore". We fell in love with the Boxer breed 20 years ago when researching what would be an ideal family pet for our two young sons. It has now become what we like to call “a hobby gone wild”. As a home-based kennel, all of our dogs live in the house with us. Our dogs are truly a part of our family! 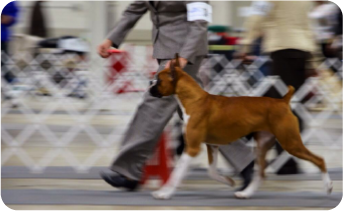 Each of our dogs is shown in conformation until their AKC (American Kennel Club) Championship is attained. We attend numerous classes and are always working toward something new with our canine companions. Many of our dogs have earned other titles including CGC (canine good citizen) and Rally Obedience. 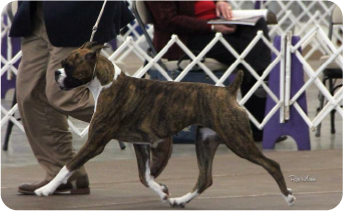 At Glenmere Boxers we endeavor to breed the healthiest puppies that we can. This means that we will not plan a breeding until all necessary health testing has been performed and the dog is of age. All puppies are raised in our home, and receive the highest level of care. Founder/owner of Glenmere Boxers, Pam Holzapfel, is a member and past president of The New Jersey Boxer Club, and a member in good standing of The American Boxer Club. We hope you enjoy our site and each of our dogs’ bio pages. Feel free to contact us concerning any litters we currently have or may have planned. We look forward to hearing from you! A home based kennel breeding for health and temperament!